FONTANA, CA – Fontana Unified’s Class of 2018 celebrated 12 valedictorians and salutatorians from five comprehensive high schools, many of whom will pursue higher education and careers in science, technology, engineering, arts and mathematics (STEAM) fields. Henry J. Kaiser High School honored the Class of 2018 on May 22, celebrating the end of a fiercely competitive academic year for its 539 graduates. The school named four co-valedictorians: Feliciano Cortes, Amandeep Heyer, Winnie Huang and Sahvannah Rodriguez, who pushed each other to new levels of excellence. 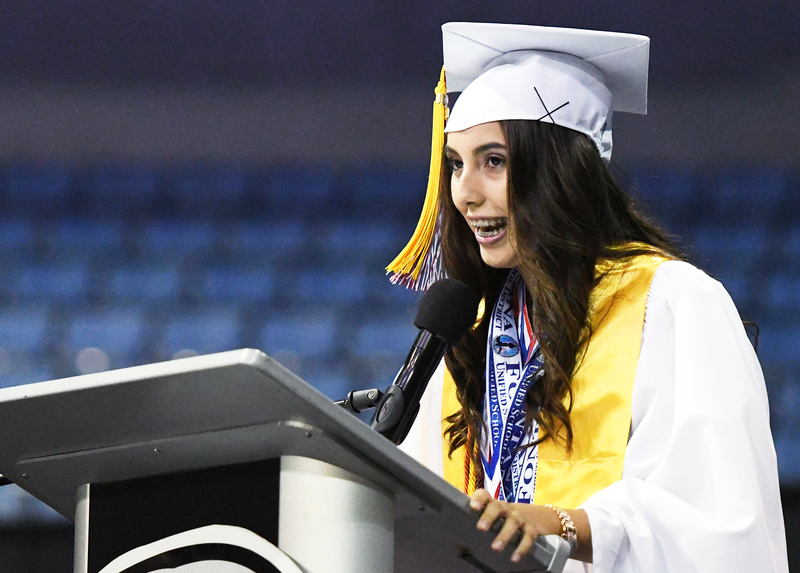 052918_FUSD_GRADUATION1: Fontana High School graduate Alexandra Ortega delivers her valedictorian’s address during the May 22 commencement ceremony. Ortega will study biochemistry at UCLA in the fall. 052918_FUSD_GRADUATION2: Kaiser High School co-valedictorian Winnie Huang addresses her fellow graduates during the May 22 ceremony. Huang, who was awarded a $40,000 STEM scholarship from Edison International, plans to study mechanical engineering at Stanford University. 052918_FUSD_GRADUATION3: A.B. 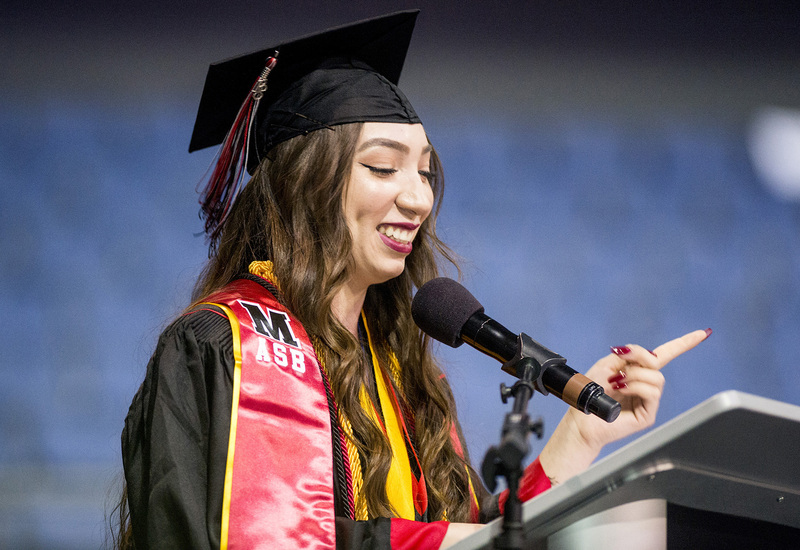 Miller High School salutatorian Jakeline Larios thanks her peers and teachers during the school’s graduation ceremony on May 24. Larios will study biology at UCLA and plans to become a doctor. 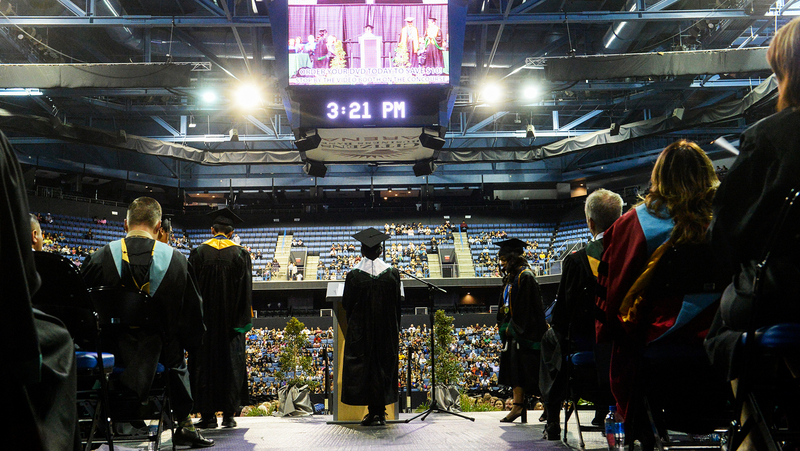 Kaiser High School co-valedictorian Winnie Huang addresses her fellow graduates during the May 22 ceremony. Huang, who was awarded a $40,000 STEM scholarship from Edison International, plans to study mechanical engineering at Stanford University. Fontana High School graduate Alexandra Ortega delivers her valedictorian’s address during the May 22 commencement ceremony. Ortega will study biochemistry at UCLA in the fall.